loofie and mishka: Ahoy There Matey! My adorable little nephew turned one late last year and I just had to make him a outfit to wear for his birthday party. My sister also asked me to help out with the party so we put our heads together and came up with a nautical theme and that could only mean that little Mr Ruby needed a sailor suit. 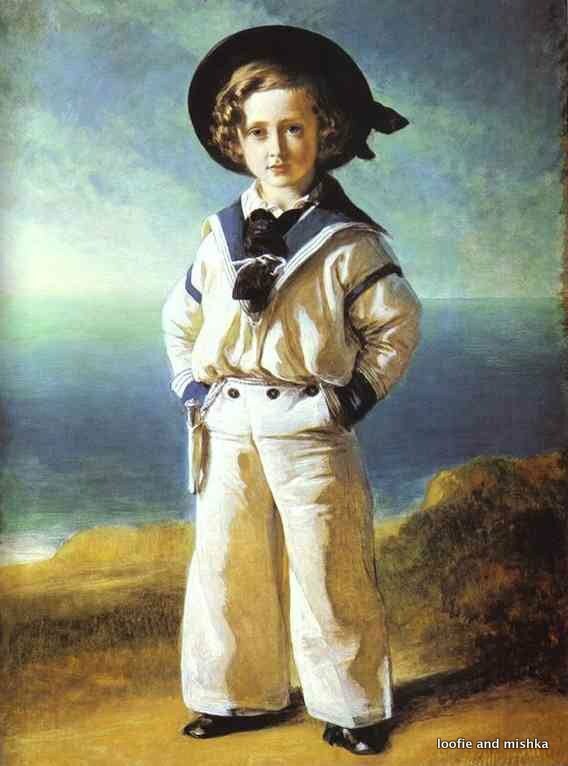 My inspiration for the sailor suit was this portrait of Prince Albert Edward (the future King Edward VII) isn't he cute? what's not to love about little boys in sailor suits. My fist hurdle came in finding a suitable pattern, there is a very cute sailor suit in Ottobre 3/2013 but it was too big for Mr Ruby (drats) after much searching I found a vintage pattern: Burda 6927 in the right size range all I can say is thank goodness for eBay! Here I must say a few words about actually reading the instructions that come with the pattern, especially with vintage patterns. I omitted this step and had to cut the pattern out twice, I foolishly assumed that the pattern included the standard seam allowance like most of the big pattern companies; it didn't and I had to re-cut the whole thing. Seam allowance is the area of fabric between the stitching line and the edge of the fabric, you can see the borders around the pattern pieces above that is the seam allowance. European pattern manufacturers do not include seam allowance to their patterns and I prefer this way of working. I would like to say that I have learned my lesson and will alway read instructions first... but that would be a total lie. I think I use this foot every time I sew, it is especially good to sew nice straight rows of stitching close to the edge of ribbon or other trims- and if you have seen my Princess Seraphina dress you will see I do a whole lot of attaching ribbon to fabric! I also made use of Stylefix tape to hold the ribbon in place while I was sewing. Since this was a special gift for my nephew I decided to use the piece of red Liberty lawn that I had hoarded hidden in my stash to make some piping for the bib collar and to make a little tie thingy. The bib collar was probably the most difficult part of the whole outfit, I really like the striking white, navy and red. The rest of the outfit was pretty quick to come together, I used some lovely shiny brass buttons I had left over from a Hobbit costume (it is normal to have shiny brass buttons hanging around in case you need to make a hobbit costume or a sailor suit right?) I also made the little guy a hat, because everyone knows that a sailor suit includes a hat; I used a pattern from Ottobre 3/2011 for the hat. So now all that is left to do is to show off my very cute little nephew Mr Ruby in his sailor suit. I hope you enjoyed this little look inside my sewing room. always a classic, them sailors, he looks real gorgeous! A job well done!